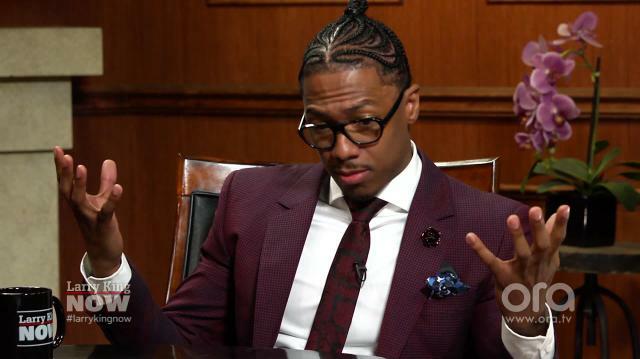 Nick Cannon says he doesn’t think either presidential candidate represents black communities, and that Hillary Clinton and Donald Trump are going to have to work to earn his vote. at the helm. So I'm saying like I'm not really interested in the pageantry. Local voting, understanding who our City Council is, understanding the propositions and things that are going on, definitely supporting that, but when it comes to that, that pageantry, that political apathy I'm not interested. King: But if blacks stay home you're going to elect Trump. Cannon: Nah, see do you,Larry do you really think it works that way? I personally don't feel that, you know, 'cause I've gotten a lot of responses were like well by not voting that's electing Trump. King: Don't you think so? responsible for communities and that's where the issue is. The issue falls with, you know, whether we want to talk about racism or capitalism, these are the problems.King: The President can lead morality wise. Cannon: Yeah, that's exactly what they do, that's exactly what they do and to me neither candidate... the morality, not for me. King: You wanna hear what they say. Cannon: Yeah, convince me that, you know, I should vote for you because right now I don't believe in either candidate. King: How do you feel emotionally, when you see, and they capture it on video, a cop kill a guy who's unarmed.Whether he's black or white. Staten island guy was white. How do you, how do you feel emotionally? Cannon: It's heartbreaking, but in as much as I attempt to live a fearless life, it's scary. King: One bad apple spoils the bunch. man if they feel like they can, even once we even once we've shown you the video and there's stillno indictment. King: Don't believe your lying eyes. get home safely and they're taking that right away from us.